This antibody is expected to recognise both human isoforms. Synthetic peptide corresponding to Human DCTN1/p150-glued aa 1266-1278 (C terminal). A549 and Human Testis lysates. Our Abpromise guarantee covers the use of ab11806 in the following tested applications. IHC-P Use a concentration of 2 - 4 µg/ml. Perform heat mediated antigen retrieval with citrate buffer pH 6 before commencing with IHC staining protocol. Required for the cytoplasmic dynein-driven retrograde movement of vesicles and organelles along microtubules. Dynein-dynactin interaction is a key component of the mechanism of axonal transport of vesicles and organelles. Defects in DCTN1 are the cause of distal hereditary motor neuronopathy type 7B (HMN7B) [MIM:607641]; also known as progressive lower motor neuron disease (PLMND). HMN7B is a neuromuscular disorder. Distal hereditary motor neuronopathies constitute a heterogeneous group of neuromuscular disorders caused by selective degeneration of motor neurons in the anterior horn of the spinal cord, without sensory deficit in the posterior horn. The overall clinical picture consists of a classical distal muscular atrophy syndrome in the legs without clinical sensory loss. The disease starts with weakness and wasting of distal muscles of the anterior tibial and peroneal compartments of the legs. Later on, weakness and atrophy may expand to the proximal muscles of the lower limbs and/or to the distal upper limbs. Defects in DCTN1 are a cause of susceptibility to amyotrophic lateral sclerosis (ALS) [MIM:105400]. ALS is a neurodegenerative disorder affecting upper and lower motor neurons, and resulting in fatal paralysis. Sensory abnormalities are absent. Death usually occurs within 2 to 5 years. The etiology is likely to be multifactorial, involving both genetic and environmental factors. Defects in DCTN1 are the cause of Perry syndrome (PERRYS) [MIM:168605]; also called parkinsonism with alveolar hypoventilation and mental depression. Perry syndrome is a neuropsychiatric disorder characterized by mental depression not responsive to antidepressant drugs or electroconvulsive therapy, sleep disturbances, exhaustion and marked weight loss. Parkinsonism develops later and respiratory failure occurred terminally. Belongs to the dynactin 150 kDa subunit family. Ubiquitinated by a SCF complex containing FBXL5, leading to its degradation by the proteasome. Ab11806 staining (1µg/ml) of Human testis lysate (RIPA buffer, 35µg total protein per lane). Primary incubated for 1 hour. Detected by western blot using chemiluminescence. ab11806 at 2.5ug/ml staining DCTN1/p150-glued in human cerebellum tissue section by Immunohistochemistry (Formalin/PFA fixed paraffin-embedded sections). Tissue underwent antigen retrieval in steam with citrate buffer (pH 6.0). The AP-staining procedure was used for detection. 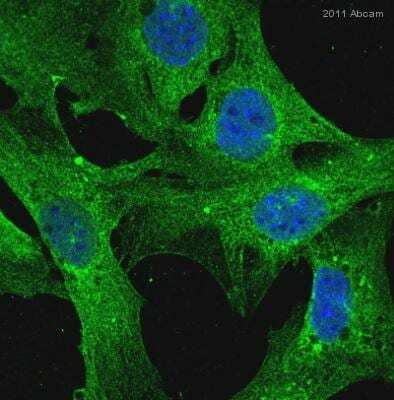 ab11806 staining DCTN1/p150-glued in Human HeLa cells by ICC/IF (Immunocytochemistry/immunofluorescence). Cells were fixed with methanol, permeabilized with 0.5% Triton X and blocked with 3% BSA for 1 hour at 23°C. Samples were incubated with primary antibody (1/100) for 1 hour. An Alexa Fluor®488-conjugated Donkey anti-goat polyclonal (1/2000) was used as the secondary antibody. 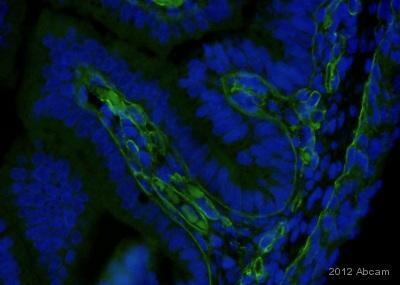 Immunohistochemical analysis of murine colon tissue, staining DCTN1/p150-glued with ab11806. Tissue was fixed with paraformaldehyde, permeabilized with 0.01% Triton X-100 and blocked with 5% BSA for 1 hour at 23°C. Samples were incubated with primary antibody (1/200 in diluent) for 12 hours at 4°C. An AlexaFluor®488-conjugated donkey anti-goat polyclonal IgG (1/800) was used as the secondary antibody. Publishing research using ab11806? Please let us know so that we can cite the reference in this datasheet. I performe experiment using ZEBRAFISH. So my question is does this antibody (ab11806 DCTN1 antibody) hac cross reactivity to zebrafish? If you have not tested (I suppose so) can I obtain a small amount of sample to test the cross reactivity before buying your antibody? Thank you for your enquiry. All the information we have on species cross reactivity is specified on the datasheet. To our knowledge, cross reactivity with zebrafish has not yet been tested. Should you decide to go ahead and purchase this product, please let us know how you get on and in return we will forward a reward of your choice, typically an Amazon gift voucher.